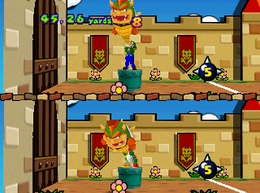 Bowser Toss is a duel minigame found in Mario Party 3. This minigame may have been inspired by how Mario defeats Bowser in Super Mario 64. Both players have 10 seconds to spin their Bowser around repeatedly. Their Bowser is thrown when the 10 seconds is up. The angle and spin of the Bowser affect how far the Bowser is thrown. Whoever throws their Bowser the furthest distance wins the minigame. Tumble: "Spin Bowser round and round, then throw him as far as possible." Goomba: "Spin Bowser by the tail and toss him as far as you can!" Tumble: "To really throw Bowser far, it's not just pressing A. The Control Stick angle is important, too." Goomba: "Both repeatedly pressing and controlling the angle with are important in giving Bowser a big toss!" This page was last edited on November 9, 2017, at 21:04.